I am a huge user of apps ( like who isn’t) and I just love having apps on my phone that helps with my spiritual journey. What I have learned over the years is to never give myself an excuse why I couldn’t do anything. 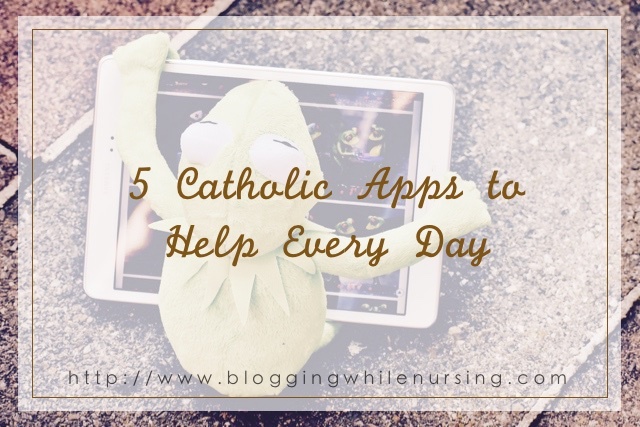 Here is a list of my top 5 Catholic Apps that I use everyday. Since having another baby, it is lucky that I am able to do my Invitatory and Morning prayers and the time that I always say it. I don’t know about you, but when I wake up, these are the first things that I say. It just starts my day off on the right foot. This is the biggest app that has an impression on me. I know I don’t have an opportunity to open my Prayer Book, so I load up this App, right when I wake up, and pray along with it. What I love about this app, is that all the prayers are downloaded in advance so that when it’s time to use it, you can go straight in for that day. 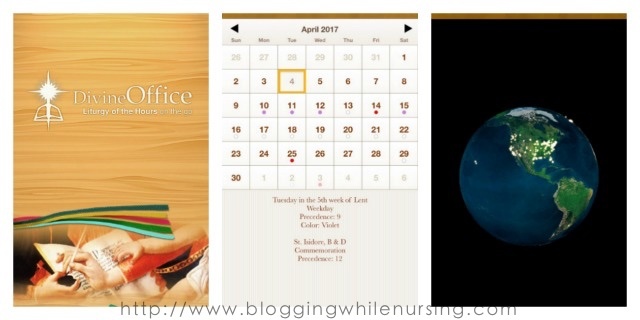 This is how I was first introduced to the Liturgy of the Hours (Divine Office), and it was because of diving into this, I made the leap and bought the prayer books (I started with the Christian prayer book then eventually made my way to the 4 volume set. Note: You do not have to go for the 4 volume set, you can pray the morning and evening (and night prayers) with the Christian Prayer book. I just wanted to be able to read the office readings as well. This little gem is wonderful when you do your daily examination of conscience. Just open the app, and go through the series of questions that it asks for each commandment. If you feel you have violated one of them, just click on the box and a number will appear. You can do this daily, and this will help you keep track of the things that you should confess. The App can keep track of your last confession and send out reminders to go to confession (of course you pick how often you want to be reminded). It helps with the daily examination of conscience (as mentioned before). All the prayers are in there! So for some of us who can’t remember the format or the prayers (Act of Contrition) it has it in there. Also, the app allows multiple users to use the app. But don’t worry! It’s password protected, so that anyone can use it, but no one but you know what you have to confess. One app, multiple users, makes this App friendly all around. I have mutiple prayer books in my home. 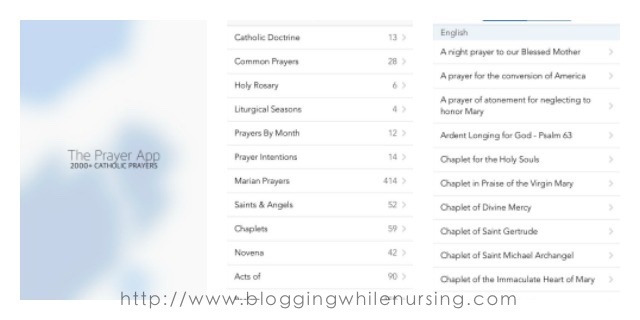 Regardless of how many prayer books that I have, I am amazed at how many Prayers, Devotions, and Chaplets there are! This little Prayer app looks simple, but it has a ton of prayers in there. While you can read off the list that they have, I love using the favorite feature. It helps me go to the prayers that I want to get to right away. I have learned so many new Chaplets, and I eventually found and additional favorite one in there that I pray using the Marian Rosary. I doubt that anyone can say all the prayers in its database every day, but there is (no doubt) something there for everyone! Also, the great news is that all the prayers are stored offline, so you can get to your prayers even on a plane (Airplane mode) or even during a blackout). I don’t use this one as much (see the next app to learn why), but I am forever thankful for this app. A few years ago, when I started to get in the habit of praying the Rosary daily, this helped me so much. It provides sacred images to meditate on while praying the Rosary. Soft clicks to know that you moved on to the next bead (when you wanted to pray with your eyes close). A different sound when you reached the end of the decade and it was time to pray the Fatima Prayer and Glory Be. A list of the mysteries, and what should be said during the season of Lent, Advent, or daily. It also includes the Saint Michael Prayer and the Chaplet of Divine Mercy. 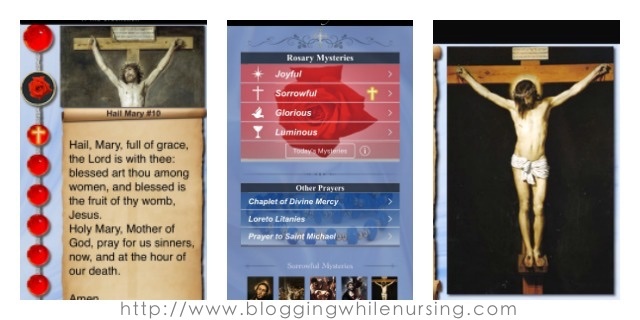 Like I said, this app was invaluable for me when I was just getting into the habit of praying the Rosary. Since I know the prayers, and the daily meditations, I usually use my beads, or sometimes my fingers. Once when you know the prayers to the Rosary by heart, then you can find yourself doing it anywhere, even while waiting on line. (My favorite is to pray the Rosary while I’m rocking / walking the baby to sleep). As I mentioned before, I don’t use my iRosary app as much anymore, because when I’m home, I use the Relevant Radio app a lot. I mean A LOT! I’m able to get the Catholic Radio station through it which is great. Where I am at, AM radio is usually weak, and where I live, it’s full of static. So, I love being able to get Catholic Radio when I need to hear it. Second, I love that this app allows you to download audio of the prayers. I like the audio for the Rosary, Divine Mercy and many others. My two children are a bit older to pray a long (well at least the 8 year old is, the 4 year old is working on it), we can say the rosary together. My children, usually hears the rosary before he goes to sleep as well. I play the long super version that has a meditation in the beginning. They describe what happened, and allows the listener to put themselves in the narrative as well. This helps him think about the life of Jesus before he goes to bed. Of course from the accessible prayer, it helps you find a parish nearby as well pulls up all the information for that parish. It has the daily readings of the Mass, Prayers in Latin, and it even has a prayer request. This App is full of goodies, and the best part, its FREE! You can spend a lot of time in this App. These are my goto Catholic Apps on my phone. I’ve tried a few others, but these had the staying power. Do you use these apps on your phone? 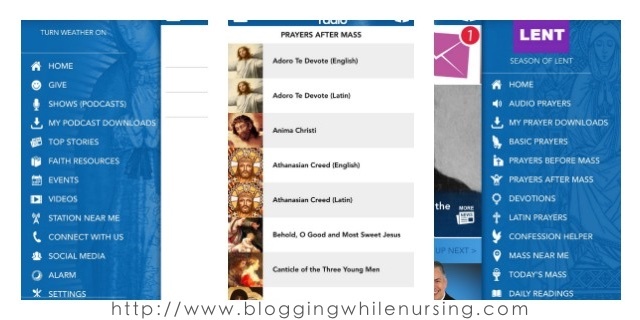 What Catholic Apps do you use? Are We Really A Society That Hates Children? 1 Comment on "5 Catholic Apps to Help Every Day"
I use Rosario. Every morning, on my way to work, I get it started and am able to go through it just as I pull in the parking lot. I’m definitely going to check out the Relevant Radio app…I just turned my Sirius off, so I’m looking for my “fix”! Thank you for the suggestion!